Our Monster Obstacle Course is set up for friendly competition play, with dual entrances and exits. It has a round obstacle entrance, taking you through maneuvering pop-ups, over climbs and down the slides for an exciting race from start to finish. The inflatable ends with a pair of tunnels. 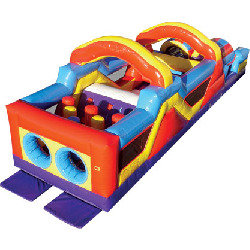 This awesome inflatable play structure can be used with our Monster Splash Water Slide with Pool for even more fun! You can exit the Monster Obstacle Course and immediately enter the climb-side of the slide, for an awesome sliding experience!